Summer is a great time for kids to be active and on the go. Spending time outside playing games, exploring, tumbling, climbing or just running around is not only great fun but is also good for your kids. They will not only be more physically healthy but they will be happier, sleep better and feel better overall! Here are some ideas for you and your kids. So what are you waiting for? Get up, get out, and get active with your kids! Hopscotch is a popular game played all over the world. It's fun, it's active and all you need is some chalk, a stone or marker, and a patch of ground. Try playing this game with your child today. Check out how to play this game. Select a smooth area on the sidewalk or driveway and use chalk to draw out a pattern of 8 squares (some single, some double) on the sidewalk. Number them in order from 1-8. Each player has their own marker, such as a flat stone, a coin, a bean bag or a bottle cap. Player 1 stands at the starting line (behind square 1) and tosses their marker into square 1. Hopping on one foot, player 1 hops over the square that contains the marker and continues to hop from square to square (always on one foot unless the pattern has two squares beside each other) until they reach square 8. On square 8, hopping on one foot, the player turns and hops back to the starting line, pausing on the way to bend over and pick up their marker. At the starting line again, the player tosses their marker into square 2 and continues as before. Getting out: A player is out if the marker fails to land in the proper square, the player steps on a line, loses balance when bending over to pick up the marker and puts a second hand or foot down, goes into a square where a marker is, or puts two feet down in a single box. Once out, the player puts their marker in the square where they will resume playing on their next turn, and a new player begins from the starting line. Note: A player must always hop over squares with markers – even if the marker belongs to another player. Modify the game for younger players. Younger children find simply hopping on one leg versus two legs in the hopscotch pattern loads of fun. The larger the squares and the more players, the harder the game. Some school yards have areas perfect for hopscotch and even a permanent pattern painted on. You can use just about anything to play catch – just make sure it won't be harmful to the players. From small soft teddy bears to bean bags, soft balls, beach balls, hard balls, soccer balls, a potato or an apple – be creative! Read more on playing catch. Start with objects that come at your child slowly and are easy to grasp. Just toss it towards the child from a few feet away. Ask your child to grab it before it hits the ground and then to reciprocate by tossing it back to you. Encourage moving around to catch the item once your child gets better at the game. More advanced games can include walking while playing catch, or inviting friends from the neighbourhood to play. Even adding more balls/objects – always keeps it age-appropriate and safe! Tossing 3 teddy bears at once isn't likely to hurt anyone, but tossing 3 hardballs would be dangerous. Learning to play catch encourages kids to get involved with more advanced ball “game” activities. If you don't have a dog of your own, ask to borrow a neighbour's or friend's dog and take it for a walk. Dogs love to go for a walk, and so are energetic and enthusiastic companions for you and your child. You might include a quick 10 minute walk in your neighbourhood and if you have one close by, even a 20 or 30 minute romp at the off-lease dog park. That would give you and your kids an opportunity to run and play with your dog a bit for a more vigorous work out. Sometimes, our busy lives don't allow us time to notice what's around us, like our own neighbourhood or other places in our city, town, or out in the country. This enjoyable game lets you and your child discover your neighbourhood, or any neighbourhood for that matter, while having fun and getting some much needed exercise. Read more on how to play this discovery game. Start this fun game while you walk around your neighbourhood with your kids. Before you start out, write up a list of 10 things you want your kids to find during your walk. For instance ask them to find a fruit tree, a brown wooden gate, a porch, a truck parked in front of a white house, a basketball net on a driveway, a house with green shutters, kids toys in the yard, etc. Be sure to pick things they can discover in your neighbourhood. Set a time limit. Maybe you need to finish the walk and the list within 45 minutes – so this makes you all walk at a good, energetic pace. If there are hilly spots in our neighborhood, try to include them to add a bit of intensity. Here's a game that needs no equipment and can be played anywhere. Read more about playing Follow the Leader. It's important for younger kids to learn that body movement is not only healthy but lots of fun too. You can start playing this popular game when your kids are about 3 years old. The goal is to tire them out with a fun adventure around the yard or a park nearby your home. Ask one of your older kids to be the leader, or do it yourself. Parade up and down stairs, all over the yard or park, around trees, over bridges, through gates, even a garage if you have one. Sit down. Stand up. Take some backward steps. Hop. Jump. Run a bit. Include some silly movements. The object is to have some fun, and for the other kids to follow everything the leader does. This game can be adapted to a variety of activities such as swimming, obstacle courses, and even playing on playground swing sets, teeter tooters, etc. And don't forget to encourage your younger kids to be the leaders sometimes!! Gardening is a great way to spend time outdoors. Spending time with nature can be very relaxing and refreshing. And you don't need a big space or a bunch of different plants to do that. A wooden box or some pots and some seeds would work just as well. And gardening provides so many different ways for you and your kids to be active! Gardening can be a great way to get moderate activity into your day. Kids can do this with their parents or older caregivers in the family. You don't need a big garden with rows of vegetables. A small window box or plant pots will also work. From watering to weeding, raking grass, planting vegetables, digging holes and planting flowers or seeds, it all counts and can be a great way to build relationships with your kids and to work towards a common goal. Bike riding is great exercise and plenty of fun for the whole family. Whether in your neighbourhood, or you load your bikes up for a ride on nearby country trails riding bikes together gives you tons of opportunities for other things to discover along the way. Stop and “smell the roses” when you're out for a ride with your kids. Take a small picnic, or ride to a local sporting game and home again. Explore the out-of-doors – mix in some hiking. And please remember that it is the law for anyone under 18 in Manitoba to wear a properly fitted and fastened protective helmet while cycling. If you don't know what geocaching (“gee-oh-kash-ing”) is you may want to find out. It's been described as a high-tech treasure hunt or an outdoor scavenger hunt. What better way to explore, discover, and have a great time! Find out more about geogaching and hiking. Players use a GPS device to find their way to the general spot that a “cache” or container is hidden and then they try and find it. The cache can be tiny, some in a challenging spot like in a tree while others are very well hidden. Still others require you to solve a riddle or puzzle. They can be found in forests, hiking trails or even in city parks and on streets. You'll need to go online to download cache listings and to record your cache finds. To begin, go to Geocaching.com and start searching your local area and other helpful links. As with hiking, always think “safety first” when exploring unfamiliar areas for caches. 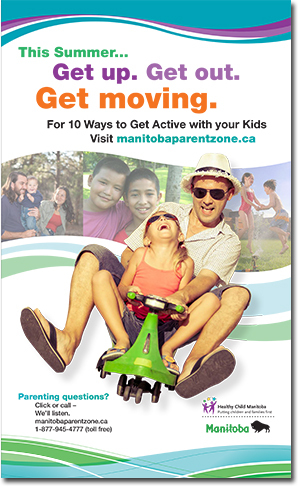 If you prefer to “just hike” with your kids, your options in Manitoba are wide and varied. Many provincial parks have short hiking trails suitable to walk with your children. Depending on their age and skill level and how long you want to hike you may want to try trails that include campsites, tables, fire pits etc. And many trails include chances for wildlife viewing! To start, perhaps check out some of the choices available at Hiking in Provincial Parks – Manitoba Parks. What is easier, more enjoyable or a better work out than a game of tag? And it's something that the whole family can play together with friends. Did you know that there are many different ways to play tag? Here are some ideas or make up your own rules and have a blast! Frozen tag: Once tagged you freeze in place until another player thaws you with a touch. Once everyone is frozen, “it” chooses someone new to be “it”. TV tag: To avoid being tagged you sit down and yell out a TV character until “it” runs off to chase another player. Reverse tag: Instead of “it” chasing after other players, they chase after “it”. Whoever tags “it” first then becomes “it”. Zombie tag: “it” is the zombie and moans and staggers around trying to tag the other players. Once tagged you become a zombie too. “it” tries to turn everyone into zombies. Blob tag: Each time “it” tags someone that player holds hands with “it” and becomes an extension of “it”. Both ends of “it” can tag people. Each time the blob gets bigger until everyone is part of the blob. In the summer there is nothing better on a hot day than going for a swim, running through a lawn sprinkler or playing at a water park or a splash park. Whether you and your kids know how to swim or just want to cool off it's a great way to have fun and get moving. Whether you live in a city, or in the country there is usually water to enjoy close by. And it is an activity that all ages of children and adults can enjoy. Contact your local Regional and Recreation Services office for fun water activities near you. And remember that children need supervision in and near water, at all times. Play safe!! For more ideas on how you can get active with your family this summer, read Active Outdoor Fun. Whatever you choose to do, get active, have fun and create a little summertime magic!